Black Friday 2017 will be here soon, but we didn't want you to have to wait to score awesome deals. 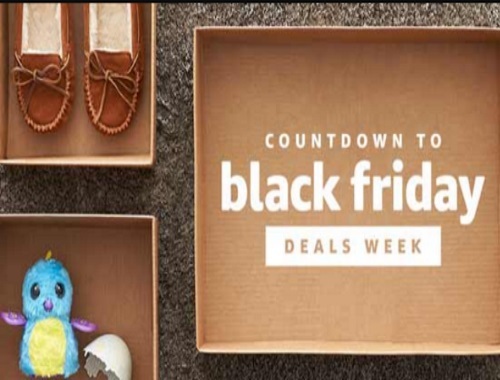 Instead, Amazon is counting down to Black Friday 2017 with exciting deals starting November 1. Stop by every day through November 24 to snag early Black Friday deals, including sales on electronics, low prices on DVDs, specials on kitchen appliances and accessories, toy bargains, and stylish savings for the whole family. You'll find their best Black Friday deals and irresistible Deal of the Day bargains at the link below. Something else to get excited about…at Amazon.ca, Black Friday 2017 isn't just a day. It's a whole week! They'll kick off Black Friday Deals Week early with Black Friday deals and sales all day, every day that week. Then, of course, there's Black Friday, with those big sales you've been waiting for. If you love a good deal, you won't want to miss it! To keep the fun going, they've made Cyber Monday 2017 a whole week, too! You'll find more great deals every day during Cyber Monday Deals Week.